Albert Pujols sat down with SI's Ben Reiter to talk about his resurgent season, his possible Hall of Fame hopes, and what the future might hold for him. 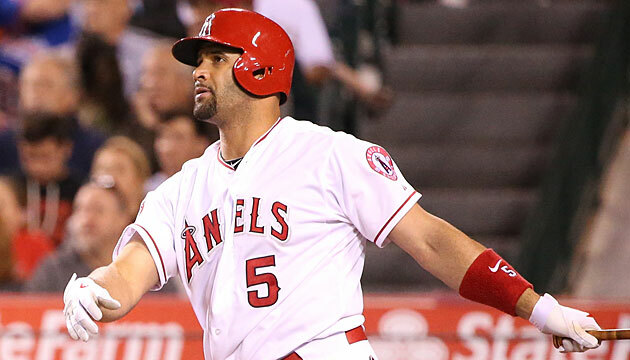 Early this spring, the Angels sensed something different about Albert Pujols. It wasn’t that Pujols, their 35-year-old, $24 million-a-year first baseman, was doing new things; it was that he was doing old ones. He hadn’t played poorly during his first three seasons in Anaheim after signing a 10-year, $240 million free agent contract in December of 2011; he batted .273 with averages of 25 home runs and 91 RBIs. But he hadn’t performed to the supernatural standard he’d set during 11 seasons with the Cardinals, with whom he was nothing short of the best hitter of his generation. With St. Louis, he had hit .328, averaging 40 homers and 121 RBIs, and had finished in the top three in the NL MVP voting eight times, winning the award in '05, '08 and '09. Age, that undefeated foe, was the popular culprit, but something else was going on. For the majority of his Angels tenure, Pujols had been hampered by a series of injuries to his lower extremities that compromised his production, forcing him to try to generate his old power with only the top half of his body. First there was an injury to his right knee in 2012 that he had to have surgically cleaned up after that season, and which remained painful through last fall. Then he tore the plantar fascia in his left foot, ending his '13 season after just 99 games. If Scioscia and the Angels could tell right away this season that they were finally getting the Pujols for whom they had paid all that money, his numbers during the first month of the regular season didn’t show it. By the end of April, he was batting .208 with three homers and nine RBIs in 86 plate appearances. A deeper look at the statistics, however, suggested that he was a victim not of poor health or age, but of bad luck. Pujols’s career batting average on balls in play is an even .300, but his BABIP this April was just .206. ​Those bullets stopped finding gloves once the calendar flipped to May. Since then, his production has been as good as ever, and as the weeks have worn on, it has only improved. Over his most recent 25 games (through Wednesday's action), Pujols is batting .356 with 15 home runs, 30 RBIs and a 1.326 OPS. After that vintage streak, he is now batting .277 overall with an AL-best 23 home runs—four more than Seattle's Nelson Cruz and Houston's Luis Valbuena—and 47 RBIs. While he is making as much contact as ever—on 86.5% of his swings, in line with his elite career norm—his finally healthy legs have restored his power: He is turning 23.5% of his fly balls into homers, the best rate of his career. Pujols’s rejuvenation has him in line to receive an honor that was once an annual fait accompli, but, somehow, is one he hasn't earned in five years: a selection to the All-Star Game. His statistics suggest that he was still good enough to have made one—between 2011, his last year in St. Louis, and '14, he had first half averages of 17 homers and 56 RBIs—but while players like Bryan LaHair, Everth Cabrera and Gaby Sanchez have been among the 116 hitters who have participated in at least one of the last four Midsummer Classics, Pujols has not. Even so, while Pujols is famously a team-first type—the majority of his answers in any interview are appended with an entirely genuine assertion of his ultimate goal, which is to bring a championship to Anaheim—he can’t help but admit that he wants to be in Cincinnati this July 14. He has challengers, including the resurgent Prince Fielder and Mark Teixeira, the newly rising Eric Hosmer and the perennially great Miguel Cabrera. Cabrera, Fielder and Hosmer were all ahead of Pujols in the most recent voting update—as was, for some reason, Blue Jays first baseman Justin Smoak—which the league released on Monday. And yet Pujols leads all of them in home runs, and trails only Cabrera in WAR. Pujols, of course, is far less concerned with All-Star politicking than with his and the Angels’ performance. “I’m having more fun, not having to worry about doing therapy, or wondering, How am I going to feel tomorrow, waking up? Am I going to be sore, am I going to be swollen?” One thing to which he does not attribute his outburst is the resolution of the Angels career of Josh Hamilton, even though the troubled slugger’s trade back to the Rangers—on April 27—came just before it began. This season’s first half has confirmed that reports of Pujols’s demise have been greatly exaggerated. He is now back to quickly revising the game’s scrolls; this season alone, he has passed Jimmie Foxx, Mickey Mantle, Willie McCovey, Frank Thomas and Ted Williams on the all-time home run list, and his 543 now rank him 16th. A deserved return to the All-Star Game, after a once unthinkable five-year absence, ought to be the next of his many honors to come.